Robeks, a trailblazer in the smoothie and juice bar industry, is now proud to add “smoothie bowl franchise” and “acai bowl franchise” to its resume. We’ve consistently led the charge on healthy food trends such as raw juices, Greek yogurt smoothies and wheatgrass shots. In keeping with our reputation of offering the latest healthy foods, we are happy to introduce our new smoothie bowls and acai bowls at our franchise locations. Like the rest of our products, our smoothie bowls are made with the farm-fresh, naturally ripened fruits and vegetables that retain nutrients, live enzymes and natural flavor. Blueberries, bananas, strawberries, granola and bee pollen are just a taste of what goes into and (on top of) our delicious smoothie bowls. 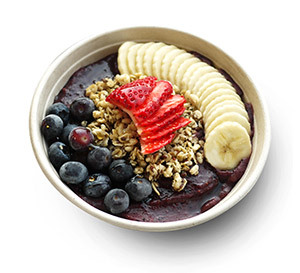 Similarly, our acai bowls feature premium acai, a superfood chock-full of antioxidants and fiber. We add delicious fruits and tasty toppings to the mix for dynamic and tasty acai bowls. Submit your information to learn more about how you can become a franchise location offering fresh juice and smoothies (as well as smoothie / acai bowls).